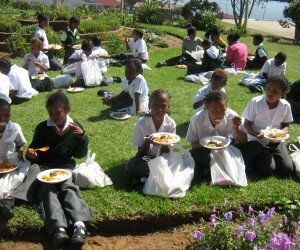 Ridgeview Primary School kids enjoy a hearty meal. Aurecon embraces the philosophy of giving back to the community by encouraging its staff’s pro-active involvement in Aurecon Cares, the firm’s corporate social investment programme. When contacted by an individual from the Mossel Bay Care Centre, a non-profit organisation Aurecon has previously supported, for assistance with the school’s feeding scheme, the group’s George office immediately took a decision to once again get involved in this worthy cause. 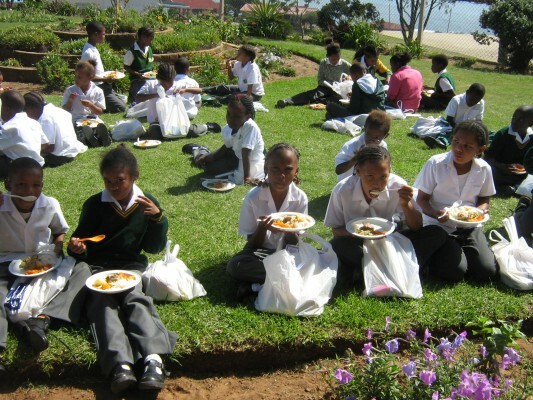 The Mossel Bay Care Centre runs various community outreach programmes, such as seeking sponsors for food, clothing and other necessities for underprivileged children. One such programme runs at George’s Ridgeview Primary School, which caters for 102 children from disadvantaged homes. For most of these children, the food they receive at school is the only meal they have for the day. Aurecon office sponsored a delicious cooked meal, which the children enjoyed thoroughly, as most of them lack a nutritious diet and consider meat a luxury. In addition, 19 Aurecon employees visited the school in person to distribute much-needed stationery, hand out goodie bags with fruits and Easter eggs, and spent some time playing games with the children. Reflecting on the day, an employee from the George office said: “Seeing the appreciation and absolute joy on these little faces really heightened my sense of gratitude for things we so often take for granted. Another participant added: “Not only was the experience personally gratifying, but it created a strong sense of team spirit among all of us involved. "It also gave us a better understanding of how Aurecon is involved in community upliftment projects.